So I've been a little busy lately - with actual work no less! 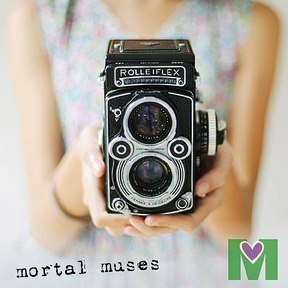 This may be my first month where I made as much writing as I did at my "real" job. BUT, that is no reason for neglecting my adoring public... or not posting. So here's a little peek at socks I've finished and am working on! The pink ones are using Sockotta, which Matt got me for our first Christmas together when we had just started dating. 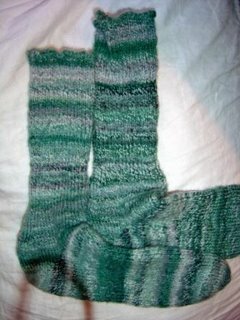 I haven't been able to wear them yet as I got so friggin sick of them while I was knitting and knitting and knitting the tiny little yarn. 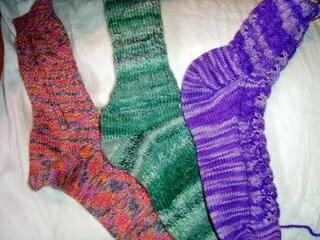 The green ones are using the Sock Hop I got from the other WHY gals for my bday and knit up using, what else, but NK's toe up pattern. I needed something thick and quick after the last pair! These are just heaven - nothing fancy but sooooo soft and comfy. 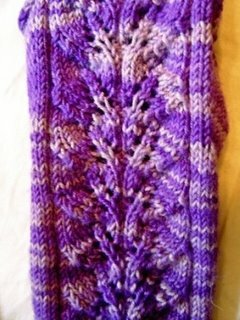 Finally, now I'm working on Baudelaire from Knitty, done in BMFA in Amethyst. It's a fun pattern - interesting enough to keep you busy, but easy to memorize and quick to knit. Plus, Cookie even includes optional instructions for high insteps! I didn't pay any attention to gauge, but the smallest size with the high instep modification fits my size 8 feet to a tee. 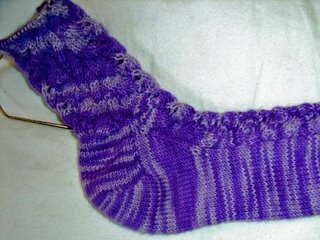 I followed her gusset heel instructions, but did substitute NK's toe as it rules. Seriously. It's the best. I love your Baudelaire's... Must.Start.Mine!!! 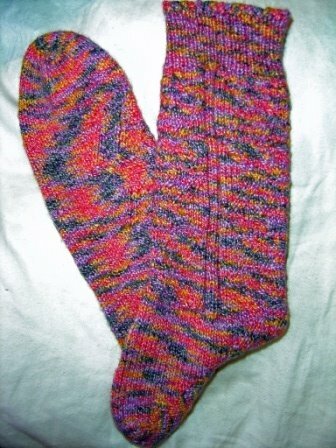 The sock hop socks are tres yummy...and kudos for finishing the Sockotta socks...You rock!! These are gorgeous! What a great job you've done on this pattern! WOW!